Christmas is coming. It is rolling down the tracks. towards us, like a fast moving train, bringing snow, ice, carols, and all things winter. I went out in the garage this morning just to look at the massively stacked containers of Christmas decorations. Then I came upstairs, shut my door and started making a list of who I could con into putting them up. I'm still thinking. There must be someone. SIGH!!! I am a great believer is replacing a negative thought with a positive one, so I am positively going to sit here and look at what other people are doing for Christmas. I hate to waste spend all this time researching alone, so I figured I should share it with you. I found these wonderful old fashioned country Christmas images. This really looks homey and inviting. Maybe I could just take my mom there and she would never know I didn't do it. Sometimes just simple and homespun is perfect. They seriously stole this idea from me. Okay, they don't know me and I doubt they ever saw my front porch, but I started doing this years ago. Who knew I was a decorating visionary. Just so you don't think I am a complete slacker, this is a stocking I made for Little Crooked Cottage. It sold, but I am going to try and get some more sewn over the next week. I think I am getting into the Christmas spirit now. So maybe this weekend I will start to drag in those boxes. Thanks to everyone for your well wishes yesterday. I took an hour long nap and then told myself to get over it. Oh you creative genius! My halloween decors are still in the tv room on a table hoping someone will come along and put them into their respective boxes. Good wishes to you and all of your kin. See, that sounded like a Christmas card or carol, huh? I love the skates on the sled! it gave me an idea. You may have stolen the ice skates on the sled idea from me :) Just this morning I was thinking about whether I was going to drag out my sled again for another Christmas on the front porch though. Maybe I need to lean it against a tree, just to shake it up a little? I haven't brought out any Christmas yet, but may have to talk my husband into helping me drag it out of the crawl space this weekend. Gosh, I wish you hadn't shown the "simple and homespun" tree. I love it! But I doubt my eight-year-old would go for it! If EVERY ornament isn't on the tree, it's a national crisis! Love, love, love the first two pics! Nope. Can't think of Christmas yet. I have a no decorating rule until the second week of December. I'm going to wait longer this year before I do anything Christmasy. I tend to get tired of it. I'm also changing all the rules this year. Not going to put up a traditional tree. Going to just wing it. Great images for Christmas inspiration! I'm glad you're feeling better. 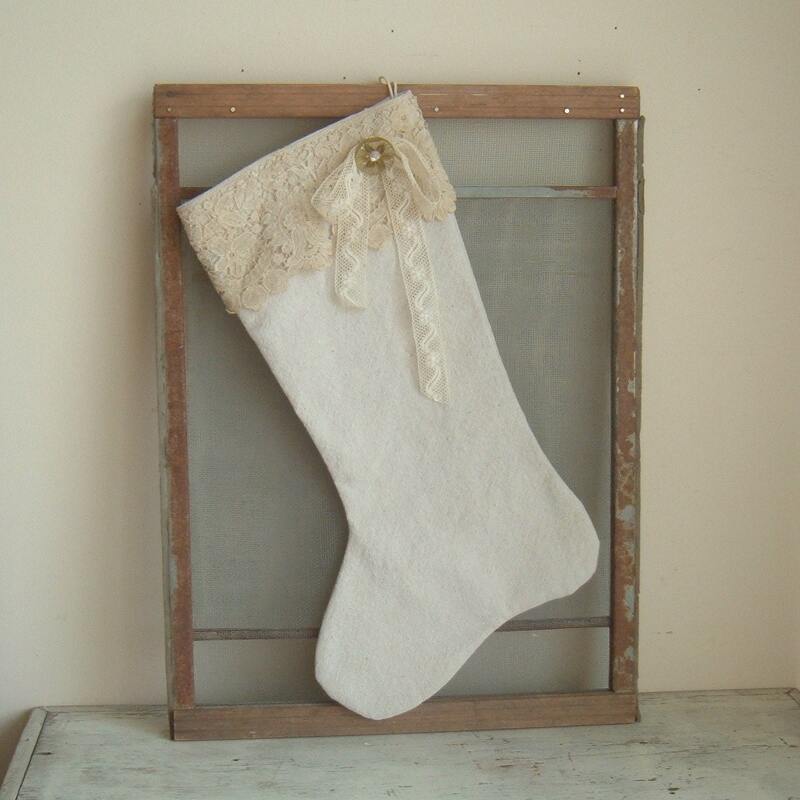 LOVE your lace stocking! I'm just not ready for Christmas this year. But your photos were inspiring. There's hope. I totally need to do the sled/skates thing. I have the sled, I just need some skates. Great ideas. I hear you- I moved Christmas boxes around all afternoon...and am dreading hauling them all in. I know once I get started I will be excited but right now- I don't want to lift one more tote. I'm waiting until Christmas eve to decorate....lol. What!! Did you have thanksgiving yet? :) I always wait till the day after thanksgiving to drag out the boxes, that's why I eat alot so I have the energy to get it all out of storage! Beautiful inspiration! Yes1 The Holidays are coming so fast this year!! !